Popular singer Habib Wahid was performed Ananda Mela of Bangladesh Television Eid magazine programme recently. A special musical programme based on Habib’s seven songs was telecasted on BTV in 2008 for the last time. Before it, he also rendered song for Ananda Mela. Nur Anwar Ronzu and Md Mahfuzar Rahman jointly making this year Eid Ananda Mela. Viewers’ attraction will be Habib’s rendered song Ghum in Ananda Mela. It is the Habib’s last rendered song which has been released on Youtube recently. Suhrid Sufina wrote its lyrics while Habib composed its music. Recording of Habib’s Ghum was done at main auditorium of BTV on June 11. Habib Wahid is a Bangladeshi composer, musician and singer. He works on modern Pop music, EDM and a fusion of traditional Bengali folk music with contemporary techno and urban beats. His music is mainly influenced by British Bangladeshis, while he was living in the UK as a student. He is the son of the 1970s singer Ferdous Wahid. He has also produced music in Indian Bengali movies. He won Bangladesh National Film Award for Best Music Director for the film Projapoti (2011). Habib Wahid was born and brought up in Dhaka, Bangladesh. He attended South Breeze School in Dhanmondi. His father, Ferdous Wahid, was a pop singer during the 1970s and 1980s. A few years later, he went to England in pursuit of higher education and studied music and audio engineering at the School of Audio Engineering in London. He is also a solo singer. 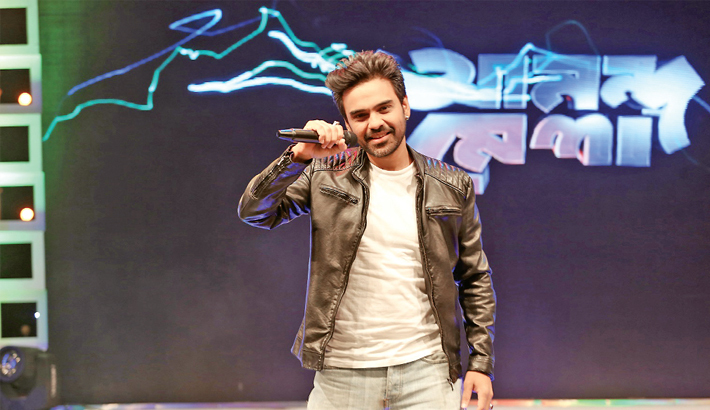 Habib Wahid made his debut with the album Krishno. He started to work with other Asian music producers such as Karsh Kale. He had already produced and planned his music, however he needed a vocalist to develop his new album. While living in London, he was searching for the vocalist Kaya, a Sylheti restaurant owner. In 2003, Habib released his first album Krishno, which proved to be a success in Britain and Bangladesh The album Krishno had a mix of folk and modern electronica music, introducing a new genre to the Dhaka music arena. In the next few years, he released six albums — Maya (2004), Moina Go (2005), Shono (2006), Panjabiwala (2007), Bolchi Tomake (2008) and Obosheshe (2008). He has featured new voices in all of his albums. Besides Kaya, he has showcased singers such as Helal, Julee, Nirjhor, Shireen and Nancy in these albums. Habib debuted as a vocal in “Moina Go” where he performed two soft singles, Din Gelo and Esho Brishti Namai. He also has his father, Ferdous Wahid singing a song in that album. On June 1, 2011 Habib’s 8th album Ahoban! was released. The album consists 9 tracks in which three are duet songs with Nancy and Kona and one was sung by Ferdous Wahid. Habib has released another album named Shadhin in December (2012).